During last week's Mobile World Congress trade show in Barcelona, Spain, I had a very interesting discussion with the folks at the Symbian Foundation. Long story short, I got a very brief look at what appears to be Nokia's answer to the iPhone. But I'm getting ahead of myself. First, some explanation: Last week at MWC, Symbian released Symbian^3, the latest version of the now-free-to-manufacturers Symbian operating system. Expected to be "feature complete" by the end of the first quarter, S^3 boasts faster networking, acceleration for 2D and 3D graphics in games and applications, HDMI support, music store integration and more (check out a video of S^3 here). The first S^3-based handsets are scheduled to launch as early as the third quarter, according to the Symbian Foundation. This is all very important because Symbian is the world's most widely deployed smartphone operating system. The Symbian OS has shipped on more than 330 million devices worldwide (mainly by Nokia). And, according to Gartner, Symbian commanded fully 46.9 percent of the global smartphone OS market last year (with 80.1 million units sold to end users), more than double BlackBerry's No. 2 position of 19.9 percent. So S^3 is pretty awesome, right? Well, maybe not so much. Nokia right now is hard at work on Symbian^4, which Symbian's Tim Holbrow said is a complete redesign of the Symbian operating system. According to Holbrow, who is chief of the Symbian Foundation's leadership team, S^4 overhauls the user interface of S^3 and also uses a different development environment--previous versions of Symbian used C++ while S^4 will use Nokia's Qt. That means applications written for the existing versions of Symbian will not work on S^4 (though Holbrow said S^3 will support both C++ and Qt as an interim step). More broadly, it means that Nokia--the chief contributor to the now-open Symbian OS--feels the need to completely overhaul its smartphone UI, which I think is an acknowledgement of the growing threat posed by BlackBerry, Android and--of course--iPhone. Indeed, Gartner's numbers show that iPhone almost doubled its share of the global smartphone market last year, from 8.2 percent in 2008 to 14.4 percent in 2009, while Symbian declined from 52.4 percent in 2008 to 46.9 percent in 2009. Further, Nokia has gone so far as to publicly recognize its failings; in a recent interview, Nokia's Anssi Vanjoki described one of the company's flagship smartphones, the Symbian-based N97, as a "tremendous disappointment" in terms of quality. Interestingly, Nokia's move to overhaul its UI has precedent: Microsoft just last week showed off its redesign of Windows Mobile. And Microsoft's share of the global smartphone OS market last year fell at a rate similar to Symbian's, according to Gartner. 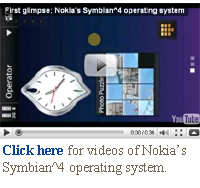 So that leads me to my conclusion: S^4 is Nokia's response to the iPhone, and at MWC I got a very brief glimpse of S^4 in action--check out the S^4 video that Symbian created based on Nokia's UI here. (Nokia released some screen shots and details of S^4 in January, but I think this is the first video of the platform.) Obviously it's difficult to draw conclusions from a one-minute video of Nokia's forthcoming UI, but I must say I'm a little underwhelmed. Aside from the nice transition animations, it looks a lot like Android and iPhone to me. Article updated Feb. 25 to clarify how the S^4 video was created.